DETROIT – – Through it all, a group of Afghan girls with a passion to build mechanical machines controlled by high-tech robots never let the countless obstacles in their way stop them from pursuing their dreams. First, they came from a culture in Afghanistan where women in general aren’t encouraged to work outside of the home. Then, on an attempt to leave their homeland for a competition, the U.S. government wouldn’t let them come before President Donald Trump came to the rescue. When they came back months later, there was only a short amount of time to prepare for events that others had much more time to get ready for. Finally, after experiencing unexpected success, they couldn’t leave when they wanted to. Such is the tale of the all-female robotics team called the Afghan Dreamers over the past 10 months. The appropriately named group of high school students from Afghanistan capped off a whirlwind few months on the final weekend in April, when the team found itself competing for a world championship and posing for pictures with Michigan Gov. Rick Snyder at the FIRST Championship international robotics competition in Detroit. Last July, the team traveled to the U.S. Embassy in Kabul in hopes of getting visas to travel to the United States and compete in a FIRST Global Challenge in Washington D.C. The visas were denied twice. But after hearing about their case, Trump asked the National Security Council for help, and the NSC in turn consulted the State Department and the Department of Homeland Security. A week before the event, the DHS allowed the girls to enter on a temporary “parole” status, which allowed them to stay without an official visa, on the grounds there is a public benefit to their visit. The team competed in the event and flew back home, but they would be back for more this year. 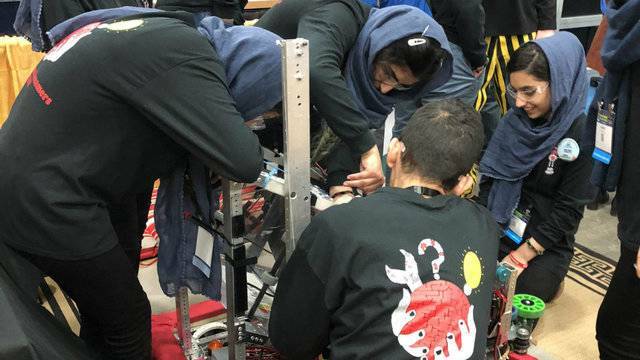 This year, team members with FIRST Robotics Canada invited the team to train with them, and the Dreamers arrived in the middle of January to practice with St. Mildred’s Lightbourn, a team based in Oakville, Ontario. Knowing little English and not familiar with Canadian culture, the Dreamers stayed with families of Lightbourn team members as they got ready for competitions in Canada. With only four weeks to build their robot, the Dreamers learned how to use machinery to build parts and assemble a finished product before a pair of March competitions in Canada. The Dreamers were originally slated to head back home to Afghanistan on April 2, but one “minor” detail spoiled those plans. Indeed, the Dreamers did well enough that they were able to advance to the world championship in Detroit, which happily delayed their return home by another month. While in Detroit, the team ended up taking a picture with Snyder as he was visiting with teams at the event. The Dreamers went 4-6 during the competition and finished 48th in the Archimedes division. While the Dreamers made a mark on the robotics circuit worldwide, that is nothing compared what they have done to open doors back in their home country. First and foremost, establishing an all-female robotics team in Afghanistan isn’t easy. In the country’s culture, robotics is not popular and the idea of women getting involved in it is frowned upon. The team was formed by noted Afghanistan entrepreneur and philanthropist Roya Mahboob, and 2,000 girls first applied to be a part of the squad. Eventually, the group was whittled down to 12, with six traveling to North America. The team has also been a part of a fundraising project to raise $500,000 to build a STEM – or science, technology, engineering and math – school in Afghanistan, an effort that is just about complete. It will be the first STEM school built in Afghanistan. “We will start construction in 2019 and the school will be ready in 2020,” team member Sahar Barak said. While in Detroit, Barak said the team was scheduled to spend a week in New York City after the competition and then fly back home. It’s likely the team will return to the U.S. soon for more competition, and when it does, other teams around the world will likely continue to realize the Dreamers are dreamers in name only. They’ve already turned what seemed to be impossible dreams into reality.